A Professor of Ruminant Nutrition and Forage Science in the Department of Pasture and Range Management (PRM), College of Animal Science and Livestock Production (COLANIM) of the University, Professor Oluwasanmi Arigbede, has called for an all-inclusive and adoptable research for the good of the society. 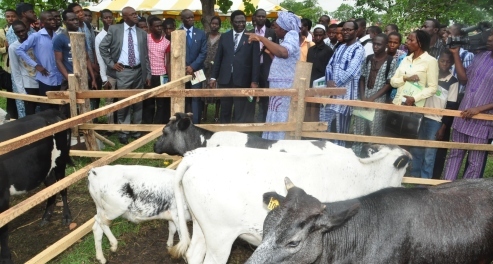 Discussing some of his research findings, Professor Arigbede, who also doubles as the Director, Centre for Innovation and Strategy in Learning and Teaching (CISLT), said that it had been observed, over the years that, there was always lack of adequate feeds, in terms of quality and quantity for farmers to feed their ruminant animals during the dry seasons. This has brought about his concern, on how feeds can be made available for the animals in these categories, in and out of season. This quest has brought about his involvement in various researchers and research institutes that had brought about initiatives such as the Forage-based Pellets and the Forage-based Feed Blocks, which are presently being fed to the West African dwarf rams, for adaptability purposes. Professor Arigbede said that he started his research on the multipurpose trees alongside the International Livestock Research Institute (ILRI) and the International Institute for Tropical Agriculture (IITA), Ibadan, where he and other co-researchers were engaged in livestock integration into Alley Farming, under the Alley Farming Network for Tropical Africa (AFNETA), which involves making forage resources useful in various forms, through feeding them to animals. According to him, over the years, they have worked with the foliage, which have earned him and the research team enough publications. As a means of helping poor farmers, Professor Arigbede said that he was committed to achieving his aim by working on Multipurpose Tree Species, and looking forward to commercialising the products, as the research had metamorphosed through various stages, from forage conservation to value addition, to conserved forages, which is aimed at preserving not only the forage and seeds, but also preserve the quality, so that the feeds can last long and the farmers would not be under pressure to give them, as feed to the animals. Professor Arigbede said the Forage-based Feed Blocks had been tested and the animals were performing well on it while the Forage-based Pellets had just been introduced. The joy of the feed pellet is that, they have a very good weight, preserved longer with high acceptability to ruminant animal. He promised that they (researchers) were already looking into food pellets and their various forms, to know the best combination that animals would most likely get well adaptable to, so that they can mass produce and package in various retail weights for sale to farmers. He listed some of the Multipurpose Tree Species (MPTS) he had worked on to include: Enterolobium cyclocarpum, Ear Pod Tree; Pterocarpus santalinoides, Osun plant; Ficus thoningu; Millettia griffoniana; Grewia pubescens; Treculia Africana (bread fruit) as well as Moringa oleifera. The Don noted that establishments, such as the Research and Development Centre (RESDEC), which later metamorphosed into the Institute of Food Security, Environmental Resources and Agricultural Research (IFSERAR) of FUNAAB, the Alexander Von Humboldt Foundation (AvH) and the Directorate of Grants Managements, FUNAAB had been very supportive with grants, at various periods when they ought to be, while he, on his part had equally took loans when necessary, just to get things done for his research. He described research as a call for passion, while advising those that do not have passion for it, not to venture going into the exercise, even if they have the resources. On the nation’s agricultural policy, Professor Arigbede frowned at poor implementation approach adopted by the government, which he said was the bane of its development. He also narrowed down to the issue of grazing reserves bill being debated often among our leaders, as it is presently affecting it. And on herdsmen’s attacks, he said that they (herdsmen) had a long history with some of the people by co-habiting peacefully with them. He asked: why was there killing in some parts of the country? And why are herdsmen the culprits? The Don, however, stressed the need to ascertain, if truly, the perpetrators were Fulani herdsmen from Nigeria or not.